The Mission Sin Caja project was conceived circa 2005 as a lasting tribute to my parents, to enhance the historical appeal and romance of our family ranch, to serve as an authentic ambiance for extended family retreats as well as a hunting lodge. After completion it will be available for weddings and private events. My dream is for it to become a living history center for school children also, inspiring the study of history similar to Rancho Las Golondrinas near Santa Fe, New Mexico. 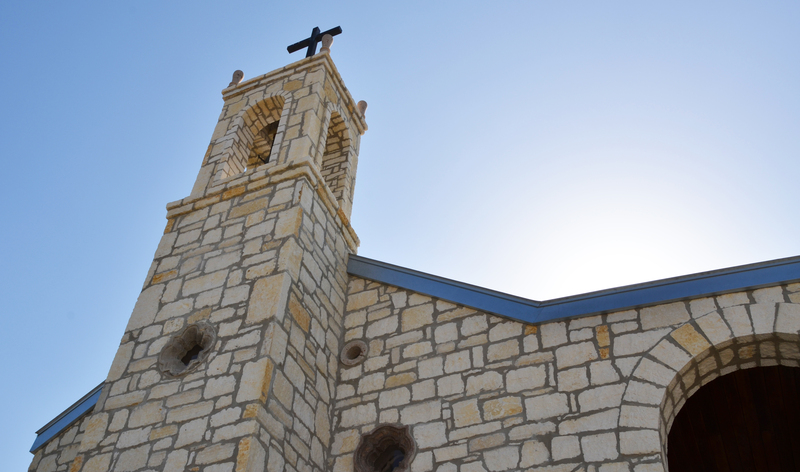 Over 5 years in development, architectural plans closely followed the missions in San Antonio. The mission is located approximately halfway (75 miles south of SA) between the Spanish missions in San Antonio and Espriritu Santu & La Bahia, at Goliad, the latter being the finest example of an 18th Century Spanish presidio in North America. 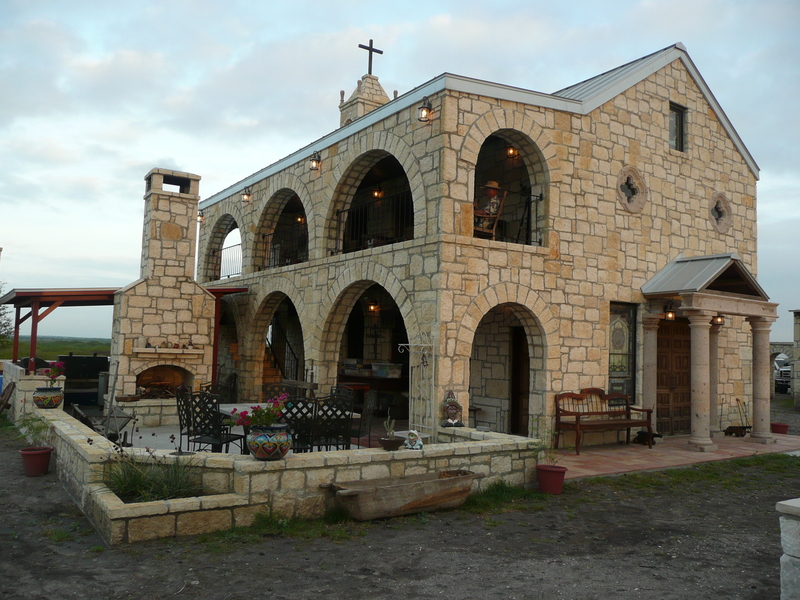 Situated on a hill, The Mission Sin Caja court yard is 100 X 300 feet enclosed by a 4′ X 2′ thick stone wall, and the mission is quite spectacular silhouetted at sunset from the ranch headquarters below. The name “Sin Caja” in Spanish refers to a mysterious mesa clearly visible from the mission some 10 miles distant on a friend’s ranch. The famous Southwestern writer J. Frank Dobie recorded “The Legend of Sin Caja” in his book Coronado’s Children (1931) and I made a documentary of it in 1984. The Sin Caja Mission augments the fascinating legend, I won’t spoil it, you will have to read the book or my booklet printed in 2005. The mission was built of authentic indigenous materials: mesquite doors, windows, frames, mantles, lintels, etc., local rock & cantera, Spanish & Mexican tiles & antiques, and furnished with 18-19th Century Spanish & Mexican furniture. The chapel features two fireplaces, the 35 ft. high main and a smaller one in the unique upper bedroom. Four nichos with 18th-19th Century santos impart a romantic glow to the sanctuary, one being illuminated by a solar ocular only one special secret day of the year at precisely 6:00 PM. The 25 foot sanctuary ceiling is vaulted by 28 beams (12″X12″) by the 3 stained glass windows (one I have had for 28 years) and the authentic Mexican mission entry doors. The architecturally unique bell tower contains an authentic bell salvaged from Galveston, Texas and is crowned by an iron cross at 45 feet. Two walnut doors are from an antebellum Louisiana plantation salvaged in the early 1900′s. All architectural details remain true to typical 18th Century Spanish missions, such as hand carved doors, the white stucco interior, Mexican tile floors, and no visible external utilities. Currently the mission features one “casita”, which is in minimalist (nod to NM) style, with viga ceiling, simple bedroom and bath with corner fireplace. The other 6 casitas have been recently completed, each abutting the main courtyard wall, corresponding to the original plans of the missions’ granary, tannery, blacksmith shop, nunnery, etc. An underground wine cellar featuring the finest in Spanish wines will mimic the tradition of the padres wine making skills. The archways of the upstairs porch overlook Sin Caja Mesa and the Nueces River Valley and the winding staircase affords secluded areas for an inspiring view and quiet solitude. With the completion of Mission Sin Caja in 2012 our dream of adding romance and warm hospitality for our visiting friends & family to our family ranch will finally be achieved and we welcome your inquiries. With the Lord’s blessing, we anticipate many happy times in the future with our family & friends, drinking margaritas, sangria, eating tapas and further exploring the spirit of traditional cuisine, libations and good times in the ambiance of the old Spanish Missions of the southwest at Mission Sin Caja.